The stability book of smaller vessels is stored with the _________________ book. 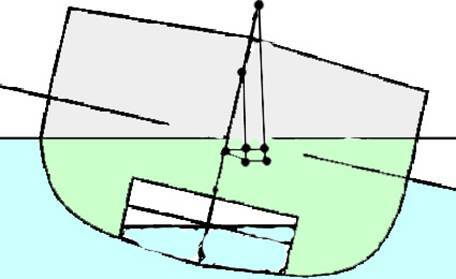 a. under the keel at the forward tangent point. c. under the keel amidships. d. the keel at the LCB. A cubic metre of fresh water weighs _________________ . a. a loss in mass equal to the mass of the fluid it displaces. b. an increase in mass equal to the mass of fluid it displaces. c. a loss in fluid equal to the mass it displaces. d. a increase in displacement equal to the mass it displaces. a. the volume of spaces above the waterline. b. a space that can flood without causing a ship to sink. c. the buoyant volume on heel. d. the volume of spaces below the waterline. c. high center of gravity. d. short rolling period . The vessel shown above is in unstable equilibrium. A vessel moved away from the upright by external forces it is said to be heeled. Trim is the difference between the forward and after draughts. On the stability curve shown below, what are the terms given to the points A, B, C and D.
A thousand litres of diesel fuel weighs approximately _________________ tonnes. 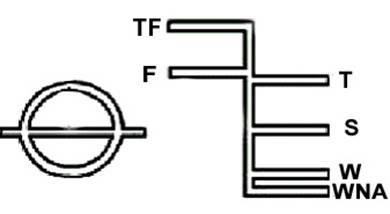 On the loadline shown below, what do TF, F, S, and W signify? 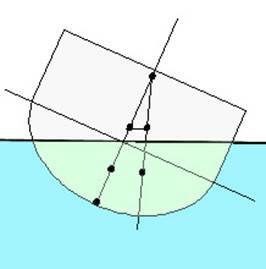 C=the initial centre of gravity of the vessel. D= the initial metacentre. a. quarter fill all slack tanks. b. increase the number of slack tanks. c. limit the number of slack tanks. d. half fill all slack tanks. Watertight doors must be closed when underway because of the possibility of bilging. a. a decrease in KM. b. shift in the CG away from weight added. c. an increase in MG.
d. shift in the CG towards the weight added. a. cause a heel to develop. a. down and to port. b. down and to starboard. c. up and to port. d. up and to starboard. a. the sum of the free surface. b. the amount of freeboard. c. the cargo carrying capacity. d. the amount of waterline. a. surface area of a slack tank. b. length of a slack tank. c. breadth of a slack tank. d. depth of a slack tank. c. lower the centre of gravity. d. press up all double bottom tanks. a. the low side of each of the double bottom tanks. b. both sides of all double bottom tank simultaneously. c. the high side of each of the double bottom tanks. d. the high side of all double bottom tanks simultaneously. a. moves downward and to port. b. moves upward and to starboard. c. moves upward and to port. a. trim by the bow. b. trim by the stern. To reduce the effects of synchronous rolling, a vessel should alter her course or speed. b. cutting larger lightening holes in floors. c. making them wider and longer. d. less, determined by the FWA. a. is occupied by water if the compartment is bilged. b. cannot be occupied by water if the compartment is bilged. a. decrease because salt water is more dense. b. increase because salt water is more dense. c. decrease because salt water is less dense. d. increase because salt water is less dense. The build up of ice ion the rigging can cause a well found vessel to______________. If a trawler’s nets become fast on an obstruction it will experience_____________ and static effects. be ______________________ immediately in order to prevent capsize. a. a condition of unequal loading. b. a condition of under loading. c. a condition of overloading. d. a condition of bottom loading. a. lashing the collided vessel’s together. b. closing all watertight hatches and doors. d. all of the choices. Draught marks must always remain__________________. (Information supplied courtesy Marine Safety, WA Department for Planning and Infrastructure). Using the Curve of Limiting KG for M.V. TWOSUCH, what is the maximum KG fluid for the vessel with a displacement of 150 tonnes? b. shift cargo onto the deck. c. empty half your tanks. d. shift cargo to the stern. If M.V. TWOSUCH floats at a hydrostatic draft of 2.80 metres, how much cargo will sink her by 20 millimetres? The loading table overleaf is incomplete. Use the Simplified Stability Information for M.V. TWOSUCH to enter the missing data to complete the loading table. Use the Curves of Limiting KG and LCG to determine whether the vessel is safe to operate in this condition. CONDITION 6 Arrival in port 100% Catch. 10% Fuel, 38% Water in equalised P&S tanks. FSE in part filled tanks. Has the vessel SAFE or UNSAFE K.G.fluid AND L.C.G in this loading condition?